I am up for a knitting challenge but always have a garter stitch project on hand. They are handy for travelling, watching TV, or chatting. I don’t have to worry about counting stitches. This is my fun scrap afghan project that I have had going for quite awhile. It is a good way to use up all of those little acrylic scraps that jump into my thrift shop basket. I just can’t resist bright colors… even if it is crappy acrylic. Luckily acrylic is cozy and great for baby items. I went through my whole collection, wrapped 12-ft pieces, loosely tied them, and tossed them in a basket. I am working my way around the afghan, changing yarn every eight garter ridges. I miter on the corners. I like that even though it is an afghan there are only eight live stitches at a time. My elbows get all twisted up if I have too many heavy stitches going on at a time. 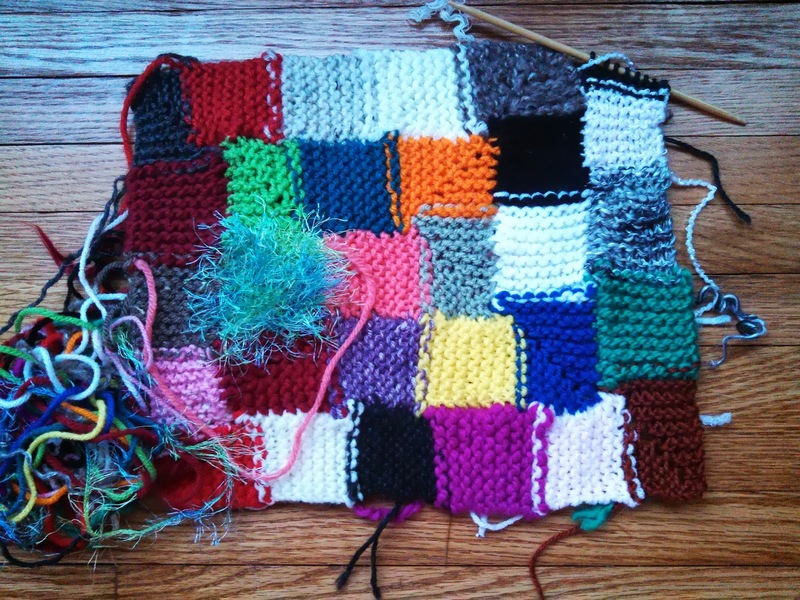 What is your favorite way to use up yarn scraps?